A well-attended meeting of subscribers to the War Memorial was held on July 4th. The recommendations of the Executive Committee were in all respects approved, and a Sub-Committee appointed to carry them out. The visible memorial is to be a life-size bronze statue of Sir Galahad standing on a granite pedestal eight feet in height. On the reverse and side faces of the pedestal are carved the 126 names — surnames, with initials only of Christian names, and no rank or regiment. The statue is to stand in the quadrangle, a few feet from the centre buttress on the east side, facing outwards. The position originally proposed, in front of the main door of College, was abandoned on the recommendation of the sculptor, who was of opinion that that position would spoil the facade, and dwarf the statue itself. There were two applications for Scholarships at the College for sons of O.V. 's who fell. Both were accepted. That completes this portion of the memorial scheme. The Book of Remembrance is already in the hands of subscribers. It was referred to fully in our last issue. The actual receipts from subscriptions are a little over £1,350. Promises and bank interest will bring the total to something over £1,400. The statue is to cost £850, the pedestal and foundation, and lettering £200, the Scholarship scheme £272, and the odd £70 will he required for sundries and contingencies. "...The monument which is about to be unveiled has been erected through the instrumentality of the Old Victorians' Association, by subscriptions from old boys and the relatives of the fallen. Out of several schemes submitted to a general meeting this monument was selected. It is the work of a distinguished artist, Mr. Alfred Turner, A.R.A., whom we had hoped to see with us today. The impression of those members of the Committee who have seen the memorial is that it is of the highest form of beauty, full of repose and expressive of reverence. The bronze represents Sir Galahad, the hero, "of manly graces," pure in life. The symbolic appropriateness of the statue is very real, indeed striking. Galahad, predestined to achieve the quest of the holy grail, foredoomed, the quest achieved, to vanish. You will soon have the opportunity of studying the memorial at your leisure, but there is one detail which requires an explanation. The emblem above the inscription is a symbol taken from the Celtic art of the early Christian period. It signifies the manifestation of God through the Holy Ghost, and was used to represent the voice saying: "This is my beloved son in whom I am well pleased." To rescue what can never die." 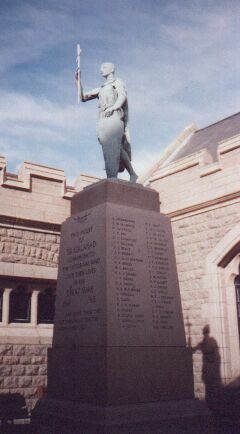 The answer is that this memorial will endure to remind present and future generations of Victorians of the splendid services rendered to their country by those who passed out of this school..."
The memorial consists of a bronze figure of "Sir Galahad," on a solid granite base, and is a veritable work of art. It was designed and executed by that famous artist, Mr. Alfred Turner, A.R.A. 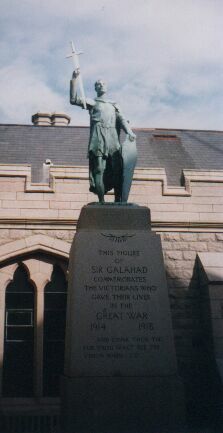 The inscription on the front of the stone is as follows: "This figure of Sir Galahad commemorates the Victorians who gave their lives in the Great War. - 1914-1918." "And come thou too, for thou shalt see the vision when I go." The contractor was Mr. C.J. Le Quesne, and the lettering, which in itself is a work of art, was effected by Mr. F. Huaut. ...the girlish Sir Galahad at the College suggests every quality that a decent schoolboy would loathe to possess. 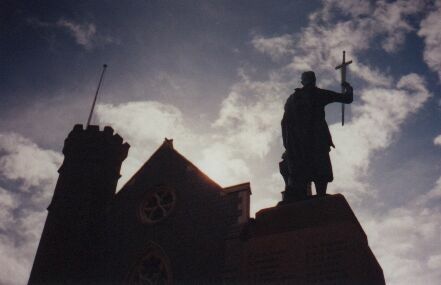 In the courtyard, bronze statue of the juvenile Sir Galahad, by Alfred Turner, constituting the school's war memorial. Good in its way and of its date, but a slightly sickly translation of the concept of Donatello's St. George to a very young man - little more than an adolescent. Mr. Alfred Turner, R.A., whose death on March 18 at the age of 66, was briefly reported in our later editions yesterday, was one of the several eminent sculptors who graduated from the City and Guilds South London Technical Art School, Kensington, under W.S.Frith, often referred to as "the Lambeth Group". His work, particularly in marble, was distinguished by an almost morbid refinement of surface finish, well seen in the graceful statue of Psyche, purchased out of the Chantrey Bequest Fund for the Tate Gallery, and in the recent head of his daughter "Billie", shown in the Academy of 1937, where his model for the memorial to John Constable, R.A., to be placed in St. Paul’s Cathedral, also appeared. At the age of 20, Turner, who was the son of a sculptor, C.E. Halsey-Turner, entered the Royal Academy Schools, where he won the gold medal and travelling studentship. For a time he worked as assistant in the studio of the late Harry Bates, A.R.A., and he taught sculpture at the L.C.C. Central School of Arts and Crafts, Southampton Row. His best known work in London is the sculpture at the Old Bailey. The Cardiff City Hall has his statue of Owen Glyndwr, and he was responsible for the sculpture on the South African War Memorial at Delville Wood, and for war memorials at various places, including Fulham, Victoria College, Jersey, and Northampton. Among his other public works are memorials to Queen Victoria at Sheffield, North Shields, and Delhi, and the King Edward Memorial, Lyalipur. since 1937 Turner had not exhibited at the Royal Academy. He married, in 1899, Charlotte Ann Gavin, and had two daughters.